The MIC2042 and MIC2043 are high-side MOSFET switches optimized for general purpose power distribution applications which require circuit protection. The devices switch up to 5.5V and as low as 0.8V while offering both programmable current limiting and thermal shutdown to protect the device and the load. A fault status output is provided in order to detect overcurrent and thermal shutdown fault conditions. Both devices employ soft-start circuitry to minimize the inrush current in applications that employ highly capacitive loads. Additionally, for tighter control over inrush current during start-up, the output slew-rate may be adjusted by an external capacitor. 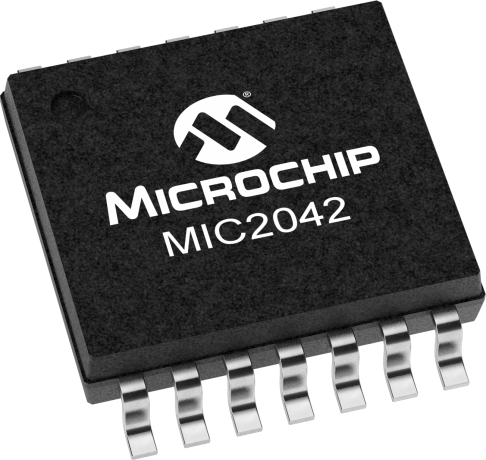 The MIC2043 features a auto-reset circuit breaker mode that latches the output off upon detecting an overcurrent condition lasting more than 28ms. The output is reset by removing or reducing the load.